Get divorce documents professionally prepared and ready to sign and file with the court. Our divorce papers are court approved and backed by our 100% money back guarantee. We make sure you are completely ready to file and complete your online divorce. 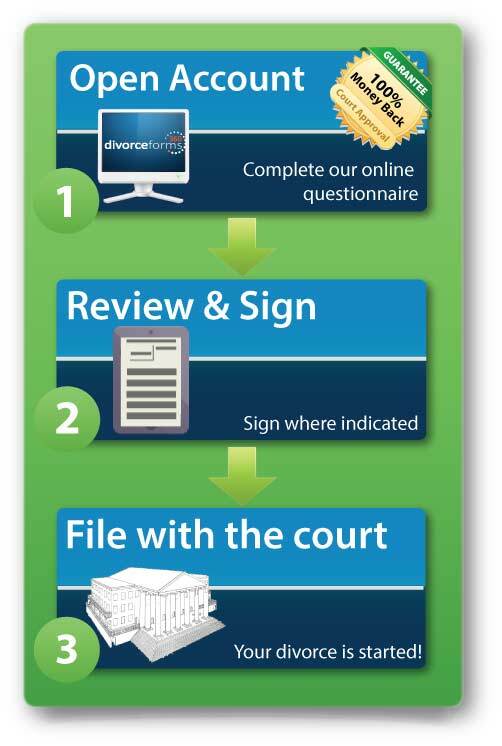 The process is easy: (1) Complete the online questionnaire, (2) Review and sign your divorce papers, and (3) file the documents with the clerk of the court. Filing a divorce with the court can be easy or difficult. It really depends on what happens before you file. If you have court approved documents that have been prepared properly, and you know what to do step-by-step through the process, then the divorce will be fairly easy. If you have bad documents and no instructions, then you probably won't get a divorce, and will have a lot of problems trying to get your divorce completed. We eliminate the hassles by providing you divorce papers that will be approved by the Judge. We understand that the divorce papers need to be professionally prepared and our service needs to be affordable. We made sure we hit on both accounts. Our documents are backed by a 100% court acceptance guarantee, and we only charge $149. Our customer's always come first. The divorce papers will be personally prepared by our divorce department specifically for your situation. If you have complex division of property, or want specific terms to the custody of your children, no problem. Your children are important. We make sure all the specific terms for custody are reflected exactly how you want the custody to be ordered by the Court. While most customer have already split the marital property, we can get as detailed as you need to ensure the property is divided according to your wishes. Every customer will have a FREE Marital Settlement Agreement included with their documents. While most online divorce companies provide "instant download" automated divorce forms, we have held true to our commitment of providing a professional, quality service. We believe it is impossible for an automated system to provide you with divorce forms that truly fit your needs, unless you have a very simple case and generic forms will work for you. We make sure every customer's divorce papers are prepared correct, and ready to file with the local court. We make the divorce process easy so that you don't need an attorney to complete your own divorce. Our support department will stay with you and help guide you through the entire divorce process.